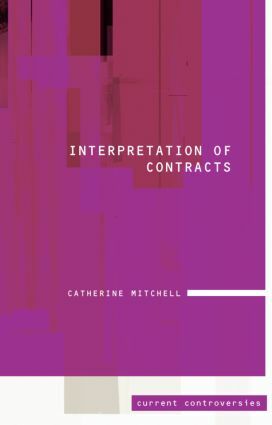 In this volume Mitchell examines case law, academic debate and the resurgence of interest in formalist contract interpretation in the US to explore the meaning of contextual interpretation, arguments for and against it and suggestions on how parties may influence the interpretation methods applied to their agreement. How far should it be possible for courts, through the process of interpretation, to control the bargain made between parties? Are judges applying the principles of interpretation in the same way? What is the relevant context of an agreement? Should contracting parties be able to opt out of a particular interpretative approach by use of mechanisms such as entire agreement clauses? Short and concise, this is a useful reference tool for those interested in contract and tort law.